Opposite the parish church, not far from Queen’s House, is the Crown Hotel, a building shown prominently by Richardson, King and Driver on their late 18th century map of the New Forest. Today, no doubt as then, it is an impressive structure, a large black and white, seemingly half-timbered building commanding the top of the High Street. The most recent substantial rebuilding took place in 1896/97. Pictures prior to this show a somewhat smaller, altogether more modest, brick-fronted building without the large dormer-type rooms and gables jutting from the pitched roof. The print by Alan Langford (illustrated) shows it well. 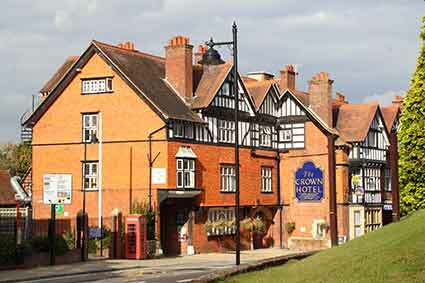 A 1600 date plaque in the style of the 1896/97 re-build is displayed on the outer wall of the current building, but the earliest reference to the Crown Hotel dates back only to 1740. 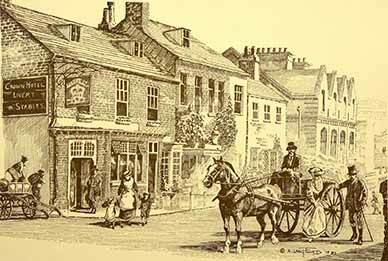 Prior to this, an inn known as the King’s Arms existed, but this was not mentioned after the end of the 17th century. It’s been suggested that the King’s Arms and the Crown are one-and-the-same - maybe the name change was to avoid the need to keep in step with Queen’s House, which changes name with the gender of the monarch. 19th century directories show the Crown as a posting house and commercial inn, indicating use by the horse-drawn mail coaches of the day. Stabling was provided and it is likely also that a change of horses was available. George Lowman was the innkeeper in 1844, and Lucy Lowman in 1851 and 1855. By 1871, George Lowman was again mentioned – presumably a son of the earlier George and Lucy. In the mid-19th century, a horse-drawn omnibus service was being advertised from the Crown Hotel to the newly opened Lyndhurst-road station, Ashurst - ‘three times a day to meet the trains’- a service that continued right up to the start of the First World War in 1914. In 1880 the Crown was in the hands of John Palmer, who in his advertising described the locality as ‘embracing some of the finest woodland scenery in Europe’. He offered ‘Good stabling for hunters, hacks and carriage horses’ and the ‘Omnibus service to meet all trains (Fares - 1s inside; 6d outside). Recalling those days, adjacent to the Crown’s main entrance can still be seen a huge stone block that was originally provided to assist travellers on and off the horse-drawn vehicles. A sketch of 1784 by Thomas Rowlandson shows the old parish church, the Crown Inn and the adjacent Duke of Gloucester’s stables – the Duke of Gloucester, younger brother of King George III, was, from 1771 until his death in 1805, Lord of the Manor of Lyndhurst and occupant of what then was known as King’s House, but now is Queen’s House. The stables were constructed at sometime between 1634 and 1673, when substantial rebuilding of King’s House was also undertaken, under orders from Charles I who desired that they be sufficient to hold 40 horses, fully befitting royal usage. By the late 18th century, they are shown by Richardson, King and Driver as the King’s Stables. After use as barracks during the Napoleonic Wars of the early 19th century, they were demolished, and the site used in 1849 for construction of the village school.